Dangers of childbirth: Why are more moms dying after babies are born? A woman’s risk for dying from pregnancy-related causes does not end once her pregnancy does. In fact, a significant number of preventable deaths happen up to 43 days later. WTOP's Rachel Nania explores death rates among moms in WTOP's special report, Dangers of Childbirth. WASHINGTON — A woman’s risk for dying from pregnancy-related causes does not end once her baby arrives. “People think that once the birth is over, that that’s the acute event, but many of these things happen after delivery,” said Dr. Barbara Levy, a physician and vice president of health policy at the American College of Obstetricians and Gynecologists. 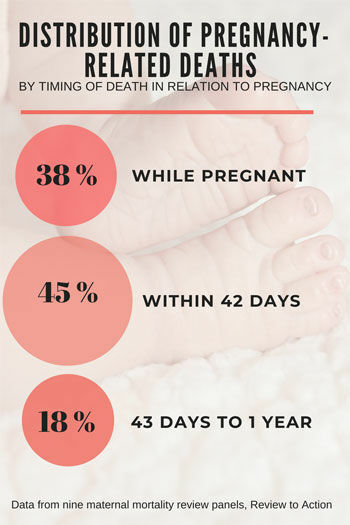 Recently compiled data from nine maternal mortality review committees around the country show the majority of pregnancy-related deaths occur within 42 days of the end of pregnancy. During that time, women most commonly die of infection, followed by hemorrhage and cardiovascular and coronary conditions. The same report classifies 66.7 percent of these deaths as preventable. That is one reason why the American College of Obstetricians and Gynecologists revised its recommendations for postpartum care in April. Previously, women were advised to meet with their doctors six weeks after giving birth. But up to 40 percent of women skip the appointment. Now, the group recommends that postpartum care be treated as an ongoing process — not just a single visit to the doctor’s office — and that all women have contact with their obstetrician-gynecologist or other care providers within the first three weeks. “It’s very important to change when we do postpartum care — move it earlier into the postpartum time frame, to do outreach to women who have pregnancy complications like high blood pressure or diabetes, so that we’re working with them much sooner than two weeks or six weeks,” Levy said. Dr. Constance Bohon, an obstetrician-gynecologist and associate clinical professor at George Washington University, said teaching patients to recognize warning signs of potential health issues after their baby arrives is also needed. However, this can be difficult — the majority of mom’s attention is on the newborn, not herself, and symptoms such as fatigue, swelling and headaches can be part of a normal recovery. “Sometimes women just don’t understand how important it is to get back to their providers to say, ‘I’m not feeling well.’ And it’s hard, it’s very hard, because there are many times that those kind of symptoms are totally benign, but sometimes they are not,” Bohon said. The day after Alexis Squire brought her baby home from the hospital, she noticed a headache she couldn’t shake. She also had swelling and spinal pain. Squire called the doctor and they told her to keep an eye on it. After that, she didn’t give it much thought. 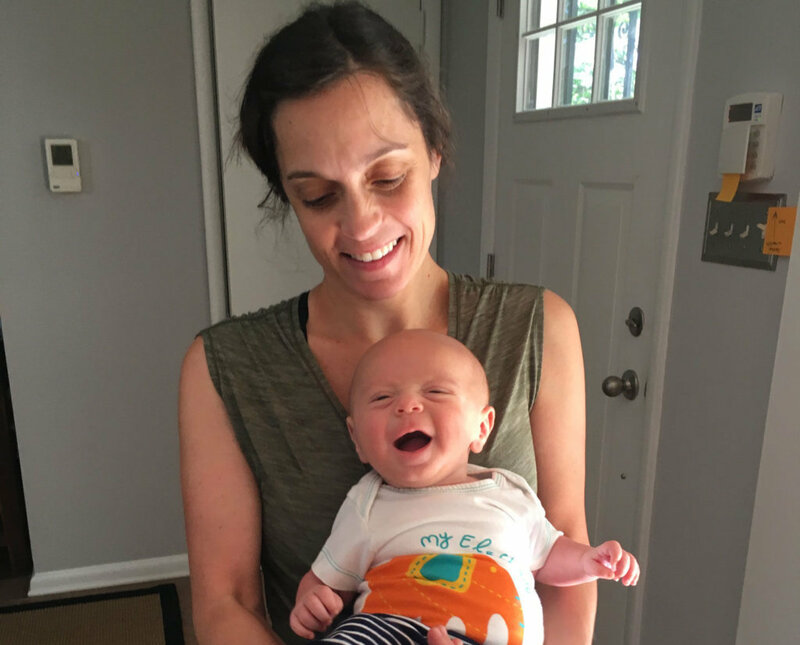 “You’re all in baby mode at that point,” said Squire, a 35-year-old Southeast D.C. resident. When the headache persisted, she went to see her primary care physician and eventually ended up in the emergency room, where she was diagnosed with postpartum pre-eclampsia — a rare condition that results from high blood pressure and excess protein in the urine. If left untreated, it can be life-threatening. ACOG’s Levy said the most important thing for women to do when they go home with a baby is to trust themselves. And for providers, it’s to listen to patients. “We want to be normal and we’re afraid to speak up when something doesn’t seem right, and then all of the physiological changes of pregnancy and then the postpartum time make health care providers discount us,” Levy said. The American College of Obstetricians and Gynecologists’ new recommendations also say that early intervention can help providers stay on top of a woman’s physical recovery from birth, as well as her mood and emotional well-being — both of which are leading underlying causes of death after childbirth. A few months after her son, Logan, was born, Jade Wexler started to realize just how much the events from the last year were affecting her. Wexler and her husband went through years of infertility treatments, followed by a difficult high-risk pregnancy that resulted in a C-section and a hemorrhage that left Wexler needing four blood transfusions. After four nights in the hospital, Wexler, 42, was sent home without her son. Logan stayed in the neonatal intensive care unit for 18 days, where she visited him for eight to 10 hours every day, while still recovering from surgery and her near-death experience. “I would just cry every night coming home and I was just in so much pain,” said Wexler, who lives in Chevy Chase, Maryland. When Logan was about 3 months old, Wexler reached out to a counselor. “I don’t know how much of it is normal postpartum kinds of stuff — I don’t think that I have postpartum depression, but I definitely have anxiety, some resentment, maybe a little anger … I really haven’t faced all that,” Wexler said. About 80 percent of women experience feelings of anxiety, worry and unhappiness shortly after childbirth, according to the National Institute of Mental Health. Fifteen percent experience more severe symptoms of postpartum depression. Data analyzed from the nine maternal mortality review committees show mental health conditions were responsible for 4.1 percent of pregnancy-related deaths within 42 days of the end of pregnancy. That number jumps to 16.2 percent between 43 days and one year after the end of a pregnancy. “Postpartum depression is real. It’s something that we see,” Bohon said. Dr. LaQuandra Nesbitt, director of D.C.’s Department of Health, said focusing on a woman’s health before pregnancy is also important in reducing rates of maternal mortality. “Healthier women have healthier birth outcomes,” said Nesbitt, who added that women who are overweight or obese at the time of pregnancy are more likely to be at risk for maternal mortality. In 2015 and 2016 combined, roughly 19 percent of women who had live births in D.C. were obese prior to pregnancy; about 22 percent were overweight. About 1 percent of women, overall, had pre-pregnancy diabetes and about 2 percent had pre-pregnancy hypertension. Having programs in place, such as access to healthy foods and chronic disease management support, can be helpful in producing better pregnancy and post-pregnancy outcomes for both mom and baby. 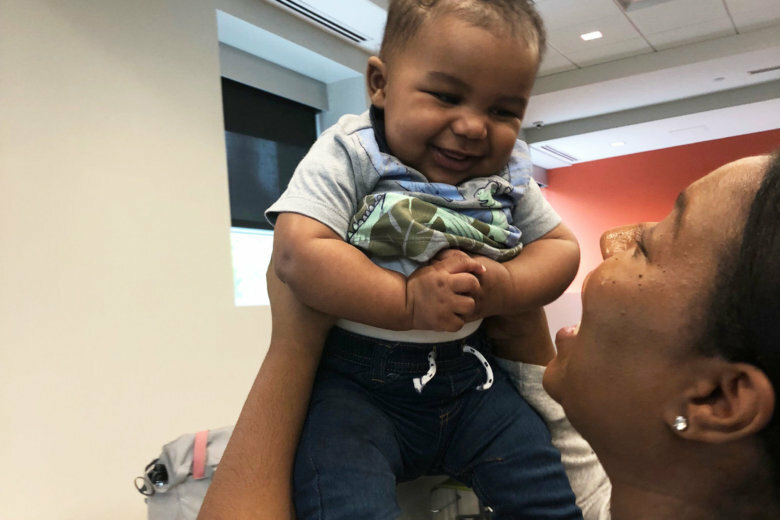 D.C.’s 2019 budget includes $1.6 million to ensure more women have access to high-quality prenatal care and neonatal care. It also requires score cards for all birthing facilities in D.C. to assess quality improvement during delivery and post-delivery care. “We know a lot about what keeps patients safe. We know a lot about what high-quality services are, and there’s a lot of evidence about what should be done for women, especially as it relates to maternity care, that we didn’t know 15 and 20 and 30 years ago,” Nesbitt said. If you’re feeling withdrawn from loved ones, overly anxious, overly sad, or have thoughts of hurting yourself or your baby, you may have postpartum depression. Find more information and helpful resources below, and talk to your doctor. If it’s an emergency, text HOME to 741741 from anywhere in the U.S. for the crisis text line, or call the National Suicide Prevention Hotline at 1-800-273-8255.